While many people have started to use electronic visuals, some classrooms and conference rooms are not yet equipped with that type of technology. Instead, transparency film is a great tool to use to provide visuals in place of slideshow presentations. Create crystal clear overhead transparencies with ease! 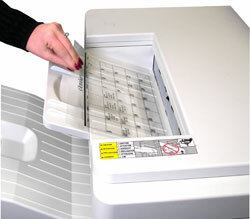 For instant overheads, use C-Line's transparency film for plain paper copiers-simply use the film in place of paper in the paper tray or the hand-feed feature of your copier. Can be used with desktop or high-speed copiers using dry toner. Size: 8 1/2 x 11. 50/BX.